The director of “Star Trek Into Darkness” J.J. Abrams has one original cast member from the 1960s television version fooled. The actor who played Pike, Sean Kenney said he looks at Abrams as being a “connoisseur” of “Star Trek”, and tells us what he thinks of the new movies J.J. Abrams has directed in this candid interview at this year’s Star Trek Convention also with actor Don Marshall who played Lieutenant Boma on the series. 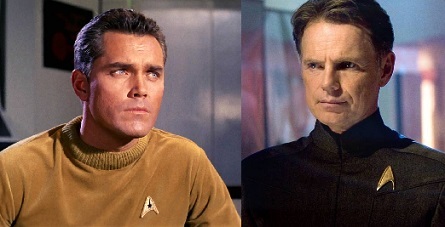 Pictured (l-r) Sean Kenney “Pike” in 1960s, Bruce Greenwood “Pike” in 2009. Don Marshall who played Lieutenant Boma on the original “Star Trek” series said of his character, “It was a very interesting character. One of the first black officers to have a part like that. It opened the doors. Roddenberry himself did that,” he stated. He also credits his role as getting him more into science fiction because before “Star Trek” he wasn’t into Sci-fi. Interview with Rod Roddenberry here. The one thing that always surprises Kenney at Star Trek conventions he said is when fans tell him how they’ve been affected by the show and how they’ve used it in their careers. Scientists tell him the reason why they like what “Star Trek” is all about is because it actually gave them ideas to push the envelope even further. “I’ve had Physicists, jet fighter pilots – come to me. They copied from ‘Star Trek.’ I think wow – how that embedded into people as children.” A fan, now in his thirties Kenney said, incorporated things seen on the show into fighting in Iraq. “It amazes me,” Kenney said. Marshall said when audiences were seeing new ideas and gadgets on “Star Trek” what they were seeing was a collaborative work of everyone on the show. Behind-the-scenes, he said, Roddenberry was very open and allowed for input from everyone. “Gene was open . He opened the doors for other people. He was not a selfish man. He was very open and giving, He let other people express themselves.” He sated this is how the cell phone-like idea came about on the show – from accumulative imaginations working together. More STAR TREK INTO DARKNESS here. If there’s one thing Kenney wishes for in all the the “Star Trek” formulas is to re-visit the “Forbidden Planet”, something that has not yet been done on any of the movies or television series. “Everybody likes forbidden” he said. 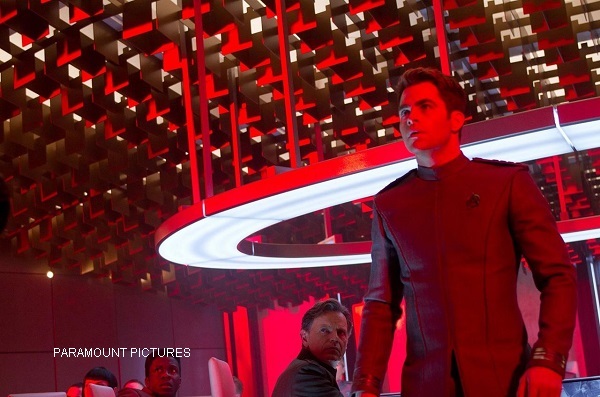 “Star Trek Into Darkness” opened in select theaters May 16 and nationwide May 17, 2013.